Download the 5-year plan implementation timeline by clicking on this document (PDF format). Timeline & Priorities. There are many tasks within each of the twelve action steps recommended in this plan. For ease of implementation, each task has been placed into an initial achievement timeline of 10 years, with tasked prioritized. First Priority. Create a comprehensive organization structure through the Canopy Team and adjust roles of the City and TreesCharlotte. Second Priority. Begin a new canopy assessment process to allow for further study of development impacts. At the same time, the city should be focusing on the development of a formal city management plan so that work is well defined and can be coordinated with partners. Third Priority. Once these are underway, the focus should be on neighborhood engagement, along with the remaining action steps. The timeline is summarized below, and available in detail in PDF format (download here). Q1 - 2017: Plan completion. Years 2-4 (2018-2020) are heavily focused on implementation related work, with annual Canopy Team meetings once a year to check in and for working groups (meeting more regularly) to report progress on tasks and reconnect with the larger Team. Year 2021 marks the 5-year point of implementation. This is an ideal time to conduct the first broad, overall evaluation of progress made to date (see the Benchmarks section below), and rework the timeline to reflect the next steps at that point based on what has worked, what is left to implement, etc. Work in Years 6-10 (2022-2026) will be determined by the progress made and next steps determined at Year 5. At some point in this time frame, another tree canopy assessment should be scheduled (five years from last UTC). Download the detailed implementation plan here (PDF format). Benchmarks & Measuring Progress. The determination of how to measure progress in coming years must be set up in the beginning. Davey recommends meeting annually to gauge short term progress, and evaluating the overall plan implementation progress every five years. These benchmarks should be agreed upon at the outset by the Canopy Team. Number of neighborhoods engaged in general. Number of neighborhoods with tree canopy plans in place or in progress. Ultimately it is up to the local community to determined which benchmarks to use, though it should be set in the beginning and agreed upon by the Canopy Team. ​​Long-term progress can be assessed after 5 years of implementation, starting in 2021. 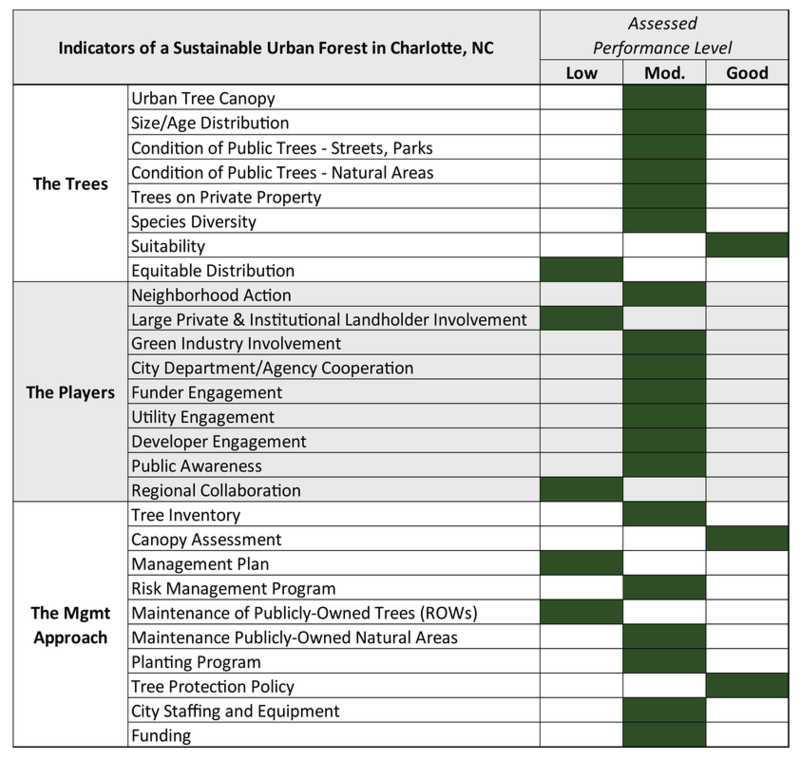 To do this, Charlotte should reassess itself utilizing the matrix of the 26 indicators of a sustainable urban forest (shown in table at right) used during the plan's original development. The tasks in each Action Step, when implemented, should move the assessed performance levels in these indicators to the next higher level. Progress can then be measured by movement within performance levels. At this point, based on the results of the re-assessment together with current challenges, a revised new 5-10 year plan should be developed.